Photo of the north pole of the dwarf planet Ceres captured by the Dawn spacecraft on April 10, 2015, from a distance of 21,000 miles (33,000 kilometers). 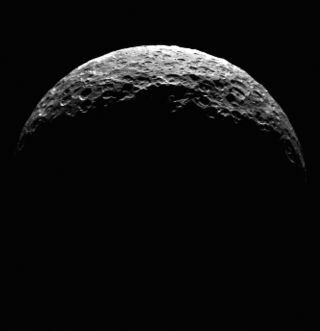 After spending several weeks in the shadow of Ceres, NASA's Dawn spacecraft is finally getting a close-up glimpse of the dwarf planet. Ceres' cratered north pole blazes through the darkness in new images captured by Dawn on April 10. The photos are the highest-resolution views of the world that Dawn has gotten since entering Ceres' orbit on March 6, NASA officials said. Dawn was about 21,000 miles (33,000 kilometers) from the dwarf planet when the pictures were taken, and mission team members promise even better views of Ceres in the months to come. Full science observations begin April 23, when lighting conditions will be better for Dawn and the probe will be even closer to Ceres — just 8,400 miles (13,500 km) above the surface. Dawn will begin moving even lower down on May 9. In future weeks, NASA hopes the mission will help scientists better understand a key mystery of Ceres: strange bright spots on its surface that, in some cases, have different temperatures than the terrain surrounding them. Mission scientists still don't know what the spots are made of. The $466 million Dawn mission, which launched in September 2007, aims to better characterize the solar system's early days by studying Ceres and Vesta, two intact protoplanets that are the largest denizens of the asteroid belt between Mars and Jupiter. The probe spent 14 months at the 330-mile-wide (530 km) Vesta in 2011 and 2012, then headed to Ceres. Mission scientists said they expect that Ceres, which is about 590 miles (950 km) wide, will be wetter than Vesta, and made of different stuff. Some researchers think Ceres may even harbor liquid water beneath its surface, perhaps making the dwarf planet capable of hosting life as we know it. Dawn will study Ceres for the next 14 months, mapping and measuring the cratered world from a series of successively closer-in orbits until June 2016, when the probe's fuel will run out and the mission will come to an end.